3 pages with regrouping the ones. 3 pages with regrouping the tens. 3 pages with regrouping the tens and ones. 2 pages of regrouping across a zero in the tens place. 1 page of regrouping across two zeros. 2 pages of a mix of all of the above. They can be used as extra practice, homework, math sprints, or as basic assessments. 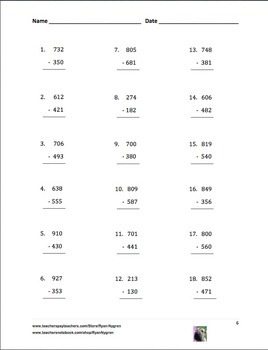 Here are all four of the 3 digit addition and subtraction worksheet packets. The value of the four products is $8.00. SAVE 25% with this bundle and pay only $5.99. Check out some of the other three digit addition and subtraction worksheets. 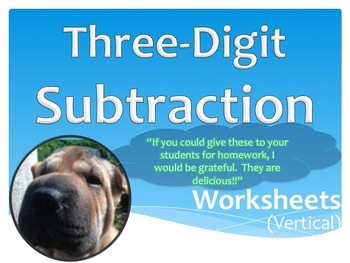 All my math worksheets can be found on this Pinterest Board. These were made by Ryan Nygren.